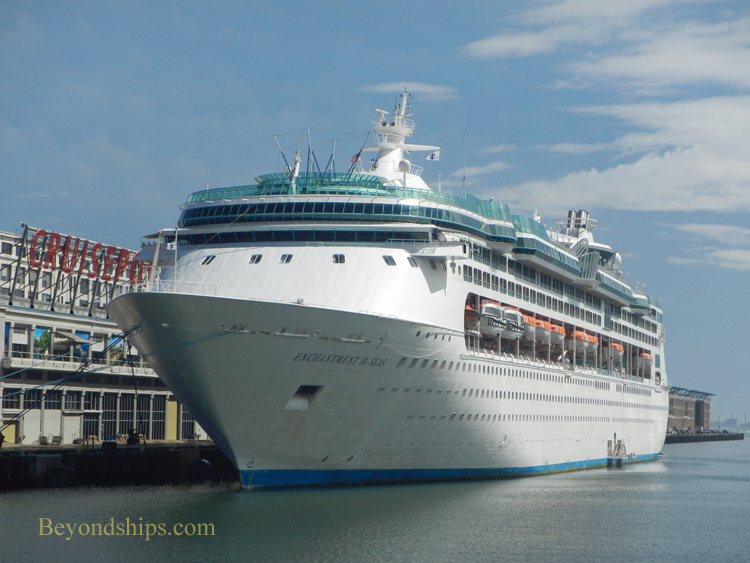 Enchantment of the Seas is not the newest or the largest ship in the Royal Caribbean fleet but those who know her have no hesitancy in pointing out that she is a special ship. “We don't have all the bells and whistles [of the larger ships] but the crew members want to work here. We don't have the 3D theater, we don't have the ice skating rink but we have the crew and that is what we are selling and that is what we are working with,” Captain Gus Andersson explained. The familial feeling is not just extended to repeat passengers but extends to newcomers as well. Take the Guest Relations Desk for example. It is the place where guests go if they have a question or if they are having a problem. On too many ships, the guests encounter a defensive response from those behind the desk. But not so on Enchantment. But what motivates people to come together as a group and create such an atmosphere? “They have to come to us first with that drive and that ambition.” Mr. Landry responded. Enchantment is going through a time of transition. In December 2012, the ship is scheduled for a major drydock in Freeport in The Bahamas. During this drydock, areas will be refurbished and new features added. Much of this work as well as training and maintenance will be carried out by the crew in a relatively short period of time. At the end, Enchantment will have changed physically but will her personality remain intact? Immediately after the drydock, Enchantment will return to Baltimore for the winter season. However, in the Spring 2013, she will change her homeport to Port Canaveral, Florida, where she will be doing three and four day cruises to The Bahamas. “Grandeur [of the Seas] will take over the run we have here and the Grandeur will become the obvious choice for the people around Baltimore. We would be the obvious choice, I hope, for the people from the central Florida area,” commented Captain Andersson.